This week we’re talking all about baby self-feeding. Why, you ask? 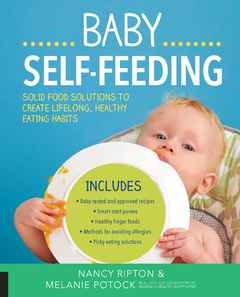 It just so happens Nancy Ripton and Melanie Potock’s new book, Baby Self-Feeding comes out on FRIDAY! We’re so excited about this book. Not only does it include tons of helpful tips, tricks, and recipes, it also helps you helps you encourage your child to be a confident and healthy eater at an early age. This week we’ll be sharing some sneak peek content from the book, like these 5 tips to help you and your child with picky eating. Enter below for your chance to win a copy of Baby Self-Feeding and a set of NumNum GOOtenstils. Designed for use with pureed foods, the NumNum GOOtensil is a pre-spoon that makes self-feeding easier for babies 6+ months. The blue NumNum uses raised textures to grab food. The orange NumNum uses surface tension to capture thicker blends. Even if your child is too young to talk, children tend to live up to the labels we give them so try not to call them a picky eater. Focus on what they do with food and celebrate the little accomplishments rather than focusing on what they don’t eat. Try to eat with your child as much as possible, showing them good table manners. If you are not hungry when it’s time to eat, you should still grab a glass of water and sit with them. This helps show the importance of family meal times and helps keep your child focused on the food in front of them. It is common for babies to reject bitter tasting foods at first. If pressured into eating something they don’t want to eat, they might gain negative impressions of that food and be less likely to try other new foods in the future. If your child pushes a certain food away, remove it and try to reintroduce it to them at a later time. It may seem like a good idea to try to get your child to eat what is on the plate, but by giving that attention you are accidently reinforcing the behavior of not eating that food. It is better to give attention to the accomplishments you child makes. Such as giving attention to them and the food they are eating. This will reinforce the good behavior of eating new foods. Too many new tastes and textures can be overwhelming for children. It may work better to introduce one new food with others that your child is already use to and enjoys. Sometimes a child might even take some time to be comfortable with the new food on their plate. Take it slow and let them get used to it.